Where good taste meets good health. Mujaddarah is a popular Middle Eastern dish made of brown lentils and rice. Some variations serve it with tomato sauce while others prefer plain yogurt. 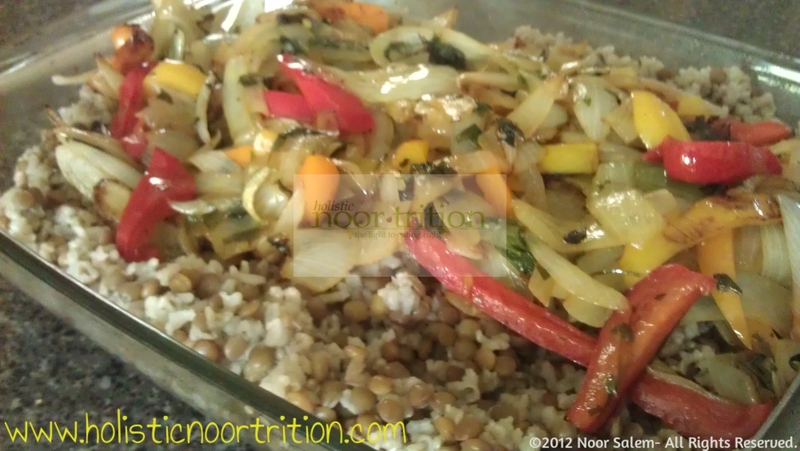 In the past I used to make Mujaddarah with brown lentils and rice topped with browned onions, aside organic plain yogurt and a diced salad. Today I took the recipe on a twist. My father purchased Certified Organic Basmati Brown Rice and I wanted to give it a try with this dish. I know that it takes longer to cook so I soaked it for 1 hour in water. Instead of just onions on top I threw in red, orange, yellow and green bell peppers as well as fresh chopped parsley. I have to say my entire family was pleased with this dish. Lentils are very beneficial, high in both protein and fiber and known for heart benefits. Throwing in brown rice adds fiber and whole grains too. Aside I made a salad with avocados (my favorite! ), fresh parsley, lettuce, tomatoes, and bell peppers. I topped it with some hot sauce and had a delicious yet nutritious meal! If you’re a person who gets bloated or GI issues from eating lentils and beans, I highly recommend that instead of running away from them, try soaking them or buying pre-sproated lentils. Soak the brown rice and lentils in separate bowls for 1 hour. In a pot put about 6 cups water and add brown lentils. Boil on high heat for 15 minutes. Add the brown rice and spices and allow to boil for about 10 more minutes (until tender). Skillet w/ oil, bell peppers, onions, and chopped parsley. 5. Place the Mujaddarah in a serving platter. 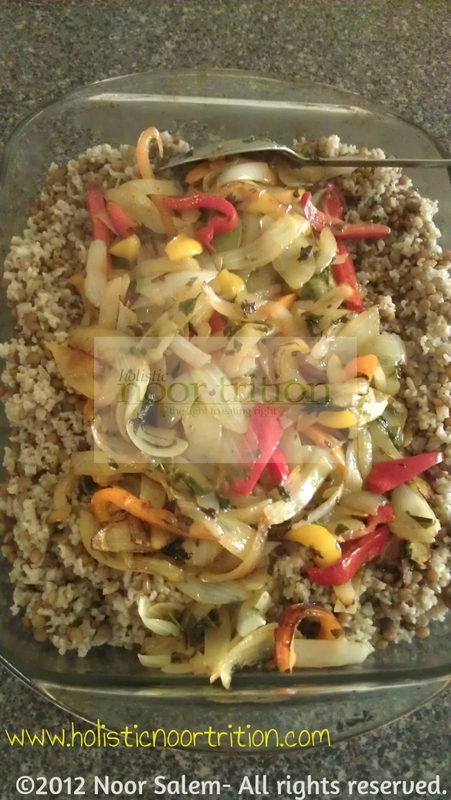 Top with onion mixture. Mujadarah gone right. Top it w/ the onion & pepper mix. 6. Serve with salad, grass-fed yogurt, and hot sauce if desired. I served it with avocado, parsley, pepper, lettuce, tomato salad. Homemade, veggie full, lemon topped grapeleaves. 1 teaspoon all spice (7 spice) My mom makes this fresh at home. Wash brown rice/burghul well in a large mixing bowl. Wash and chop tomatoes, parsley, green onions, fresh garlic ground, and optional bell peppers. Add to mixing bowl. Add lemon juice, EVOO, and spices. Mix well. 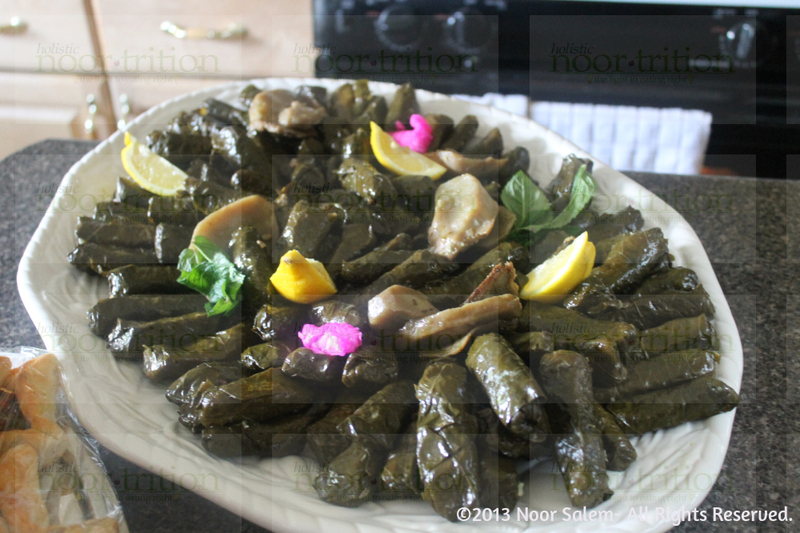 Roll into the grape leaves by placing a small line of filling the middle, folding the edges, and rolling tightly. Stack and cook in a pressure cooker about 45-60 minutes. Enjoy it with cucumber yogurt salad! Enter your email address to follow this blog and receive notifications of new posts by email, including delicious yet healthy recipes or tips. ©2014 Noor Salem- All rights reserved. This information on this blog, blackbeanbrownies.wordpress.com is provided for educational and informational purposes only, and not meant to diagnose, treat, or cure any disease, or any other physical or mental ailment of the human body. ALWAYS seek consultation from your physician or health care provider for any medical related questions, or before initiating any diet or health program, trying a new food product, dietary change, supplement, or exercise. All content and images on blackbeanbrownies.wordpress.com may not be reproduced or distributed unless permitted in writing. Noor Salem and blackbeanbrownies.wordpress.com disclaim liability for any misinterpretation or misuse of any information provided here or from any injury, sickness, or damage from the use of any recommended products. This information is not provided to replace seeking a licensed physician or health care provider.